It’s been a big week for lottery draws in the UK with the Lotto draw on Wednesday being a huge £19.2m, which was won, and now the big draws continue with the EuroMillions Superdaw today, which is guaranteed to be €120 million (or over £100 million in English money). A number of rollovers in recent weeks had meant that the jackpot for EuroMillions was at £73 million anyway, but using the reserve fund of €17 million the operators have decided to add this to the jackpot this week to bump it up to the massive Superdraw total of £104 million. 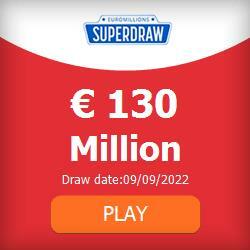 The great news with this Superdraw is that if it isn’t won today, then it will also rollover to the next draw on Tuesday to give us an even bigger money jackpot to play for. As usual you can play today’s EuroMillions in the usual way by playing online with the National Lottery or buying a ticket from a newsagents or retailer, but you can also play at a site like The Lotter, where you can buy a standard entry for the draw, enter as part of a syndicate, or bundle those two elements together. You also get the chance to win in the €100k raffle as part of your entry.